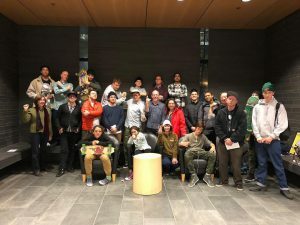 Seattle’s skateboarding community showed up in force in the City Council chambers on Tuesday night to request additional funding to make the fifth iteration of SeaSk8 Seattle’s only covered and lit public skatepark. 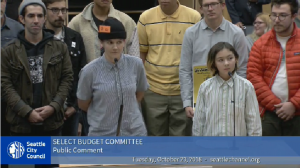 The next day, the skatepark was discussed in a budget committee meeting, where Councilmember Sally Bagshaw presented her statement of legislative intent, that asks the city to investigate what additional features the skatepark may need to truly serve the community. Unfortunately, Councilmember Bagshaw seems to have gotten the impression from someone in the architecture/design community that the existing $2.2M is enough, and no additional money is needed at this time. This is, of course, the opposite of what the skate community is saying. Since construction is not slated to begin until 2020, there is also an impression that additional funds could be found in the next budget cycle if truly needed. The video of this discussion is here and the skatepark talk starts at 1:23:08. It does not look like there will be additional funds allocated for a roof and lights at this time. There are other options for funding however, and we do have some time to pursue them. The location identified for the new park is in a high profile spot right in the middle of the future Lake-to-Bay public right of way, which may make it an appealing project to philanthropists. Any lighting equipment provider would likely be compelled to donate product in order to have their equipment showcased within a stone’s throw from so many iconic Seattle landmarks. We remain hopeful that we can find these funds and make this the skatepark Seattle’s skate community deserves. This entry was posted on Friday, October 26th, 2018 at 8:15 am and is filed under SeaSk8.You can follow any responses to this entry through the RSS 2.0 feed.You can leave a response, or trackback from your own site.